Why use a gift bag and a card when you can bring that gift bottle and simply attach this necker that can be planted and will sprout wildflowers. Add a personal message and you are good to go. 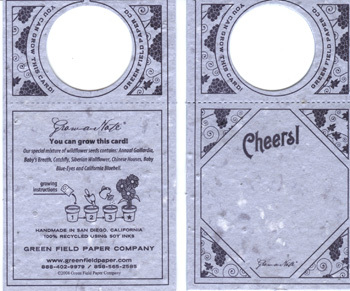 The necker is made from our handmade Grow A Note® Pinot Noir paper that is embedded with a mixture of wildflower seeds. Planting instructions are on the back. You get 6 neckers for only $8.95.